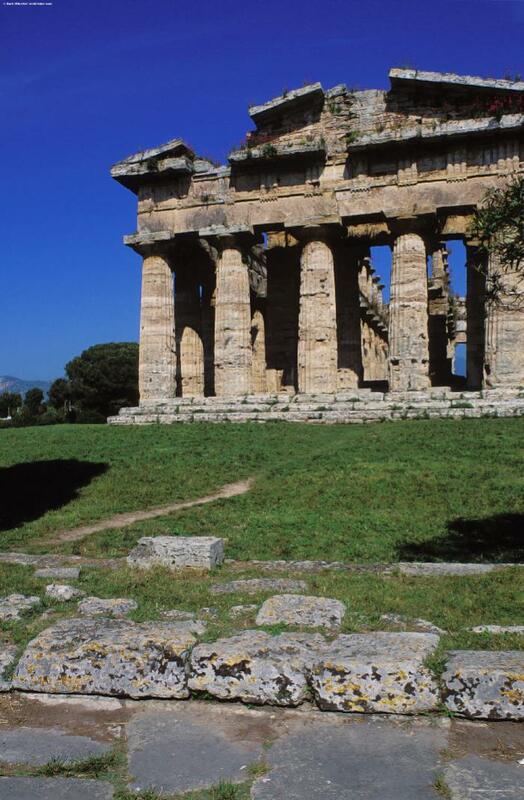 Paestum was established by Greek colonists from Sybaris. The city was conquered by the Lucanians, a local tribe, around 400 BCE. In 273 BCE it was overtaken by the Romans but only began its decline towards the end of the Empire due to malaria. Its baseless Doric temples are significant because their discovery in the mid-18th century inspired the Greek Revival. The Temple of Poseidon is also known as the Temple of Hera II or the Temple of Neptune. The temple's columns are approximately 29 feet high and 6 feet 9 inches in diameter. The temple is peripteral hexastyle, with fourteen columns on the flanks and has a crepidoma of three steps, naos and opisthodomos. The columns in the naos are in a double tier, the upper separated from the lower by a stone architrave, and not a full entablature. The number of flutes varies; the columns of the outer colonnade have 24, the inner lower order has the normal 20, and the upper has only 16.